Royal Caribbean International has created a series of cruises with special onboard programming and shore excursion packages. The new Ocean Voyages are offered on 11 ships that call at more than 35 destinations. To launch Ocean Voyages, Royal Caribbean is offering a complimentary premium beverage package for new individual bookings made in balcony- and suite-category staterooms on 13 trans-Atlantic voyages in 2014. The complimentary premium beverage package offer is available from Sept. 11 through Oct. 15 and the option code SPV3 must be used. Eligible sailings and offer details also can be found on the company website. Each Ocean Voyage will feature a guest expert, who will lead programming on topics such as culture, dance, film, visual arts, photography, and wines and cuisine. Every Ocean Voyage will have a Black & White Masquerade Party. 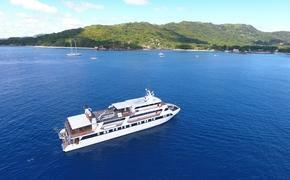 The Ocean Voyages shore excursion packages offer the choice of three options from a fixed menu. The package is priced from $99 per guest. Options include the “Sete Cidades Crater Lakes” excursion at Ponta Delgada, the Azores; exploring Mt. Teide National Park in Tenerife, the Canary Islands; and, from Funchal, Madeira, snapping photos from Europe’s highest sea cliff.